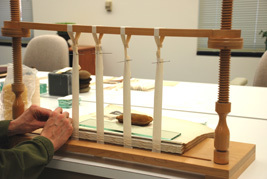 Preservation is an integral part of the California State Archives mission and plays a key role in caring for the collections housed in the archives. The primary goal of the preservation program is to ensure long-term use and appropriate storage of archival and manuscript materials. The preservation laboratory functions include various duties that encompass both the preservation and conservation of archival material. Preservation activities are designed to stabilize and protect documents against damage or deterioration. This includes monitoring the environmental conditions of the areas where collections are stored to ensure a stable temperature and relative humidity. Preservation staff also maintain an integrated pest management program. Other activities include building custom storage containers for at-risk materials; polyester encapsulation of maps, documents, and photographs; and maintaining a disaster plan. Conservation is the process of repairing damaged material using acceptable methods of repair. 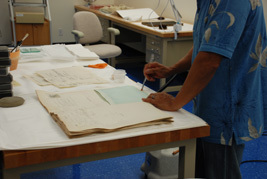 Conservation treatment is performed using materials and methods that are archivally sound and reversible. Mending paper documents is accomplished using a variety of Japanese papers and wheat starch paste. Other activities include encapsulation, cleaning, washing, and deacidification. For answers to preservation–related questions or referral to a professional conservator, please call (916) 653-7715 and ask for the Preservation Lab (Monday to Friday, 8:00 a.m. to 5:00 p.m.) or email Juan Ramos.